The iPad mini 5 was announced in March 2019 and its predecessor was released way back in September 2015. After waiting years, many people simply assumed that Apple was no longer going to make any more iPad mini models. However, the demand for the iPad mini 4 was high enough to justify a successor. The external design of the iPad mini 4 and the iPad mini 5 are identical — which has not been changed in seven years. It is mainly the internal components that are different. Both the iPad mini 4 and iPad mini 5 still have the 3.5mm headphone jack. Keeping the headphone jack on the iPad mini 5 comes as a surprise since Apple has been replacing audio input with Lightning plugs over the last few years on its iPhones. To charge the iPad mini 5, Apple did not switch over to USB-C so definitely any extra Lightning cables and chargers around. The iPad mini 4 and iPad mini 5 both have the physical home button with the built-in Touch ID fingerprint sensor (no Face ID facial recognition in the iPad mini 5 unfortunately). And the bottom of the iPad mini 4 and iPad mini 5 both have two speakers at the bottom. What makes the mini version of the iPads appealing is that they fit easier in the palm of your hand compared to other models. And this has not changed as the size of the iPad mini 4 and iPad mini 5 are exactly the same at 8.0 x 5.31 x 0.24 inches (203.2 x 134.8 x 6.1 mm). The weight of the iPad mini 5 is just a tad bit more at 300 grams compared to the iPad mini 4’s weight of 299 grams. The iPad mini 5 has an updated 7.9-inch LCD display with wide color support and it has 500 nits of brightness — which is pretty much the same as the iPad mini 4. Apple did not integrate its 3D Touch technology into the iPad mini 5 so you will not be able to push down on app icons and media files for Quick Actions. The screen resolution on the iPad mini 4 and iPad mini 5 are the same at 1,536 x 2,048 pixels. The iPad mini 5 has less storage option models compared to the iPad mini 4. But the iPad mini 5 has the advantage of offering a 256GB model whereas the highest iPad mini 4 model is 128GB. Inside of the iPad mini 5 is the powerful A12 processor with Apple’s Neural Engine and an embedded M12 coprocessor. This is the same chip that is used in Apple’s latest flagship smartphones iPhone XS and iPhone XR — which means that the performance is rock solid. So you will especially notice a difference with the iPad mini 5 while you are playing games with 3D graphics. These internal components makes the iPad mini 5 three times faster than the iPad mini 4. In terms of network connection, the iPad mini 5 has Gigabit LTE and dual-SIM support for the cellular models. And it works with most major carriers. Both the iPad mini 4 and the iPad mini 5 have the same 8-megapixel camera with an f/2.4 lens at the back. So you won’t notice much picture quality difference between the two models from the rear camera. However, the front-facing camera has been improved significantly in the iPad mini 5 at 7-megapixels with an f/2.2 lens. And the front-facing camera on the iPad mini 4 was only 1.2-megapixels. So the front-facing camera photo quality is where you will see the most significant difference between the two models. The video quality is the same on both cameras with 1080p at 30fps on the back and 720p at 120fps on the front. The Bluetooth specification the iPad mini 5 has been bumped up to Bluetooth 5.0 compared to Bluetooth 4.0 on the iPad mini 4. 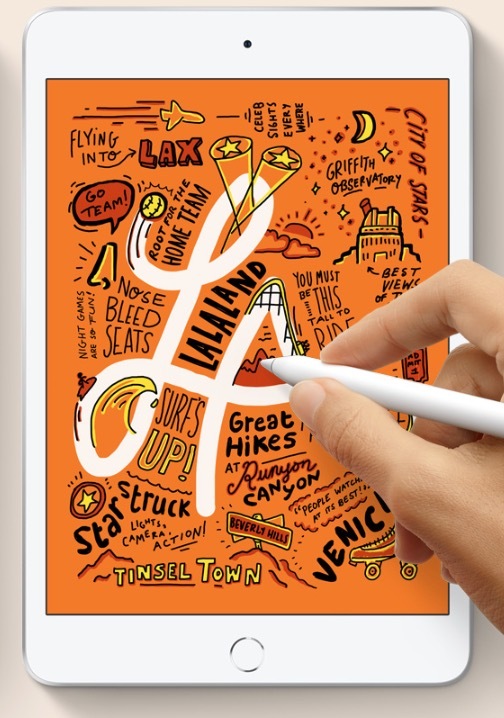 The iPad mini 5 also supports the first-generation Apple Pencil, but the iPad mini 4 does not. It comes as a surprise that Apple did not build second-generation Apple Pencil support on the new iPad mini, but I suppose some kind of Apple Pencil support is better than none at all. To charge and pair the first-generation Apple Pencil with the iPad mini 5, you plug it into the Lightning connector at the bottom. Keep in mind that the Apple Pencil currently sells at a retail price of $99. Apple kept the same colors for the iPad mini 4 and iPad mini 5. This means both models are available in silver, gold, and space gray. The iPad mini 4 and iPad mini 5 were both released with the same starting price of $399. Now that the iPad mini 5 is out, you will likely be able to buy the iPad mini 4 at a lower cost from third-party retailers like Amazon.